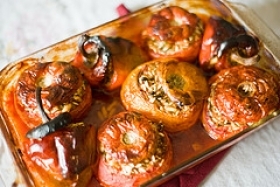 Have you made Baked Stuffed Tomatoes? 1. Grease an 8x8x2 inch baking dish. 2. Heat oil in skillet; brown onion and ground beef. 3. 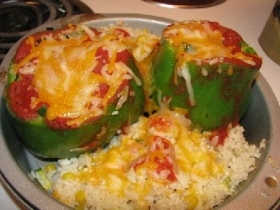 Stir in cheese, seasonings and rice. Set aside. 4. 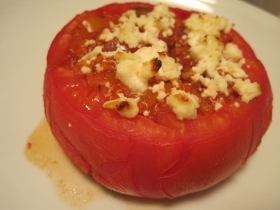 With a sharp knife, cut a 1/4 inch slice from top of each tomato. 5. Cut around inside of tomatoes, being careful not to cut through the bottom. 6. Scoop out center pulp. Sieve the tomato pulp and set aside the liquid. 7. 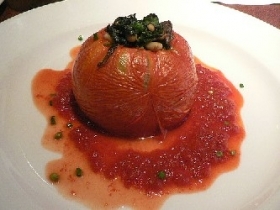 Sprinkle each tomato with salt. 8. 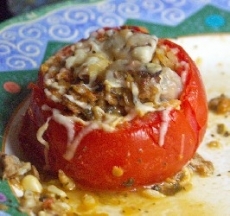 Lightly fill the tomatoes with filling. 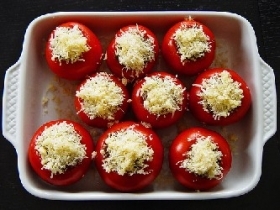 Place tomatoes in baking dish. 9. Pour the tomato juice over tomatoes. 10. Bake in a 375 degree oven for 20 to 25 minutes. 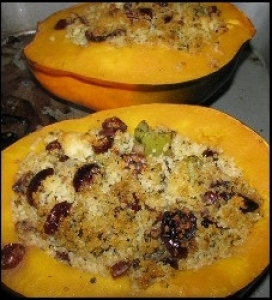 This recipe is a good source of Vitamin A with 13% of your daily recommended intake per serving. This recipe is high in Vitamin C with 47% of your daily recommended intake per serving. This recipe contains potential food allergens and will effect people with Wheat, Gluten, Tomato, Rice, Cheese, Beef, Onion allergies.